Ever since we opened our doors we have approached life (and death) differently. While some just see the end of a loved one’s life as a time for grief and mourning, we prefer to think of it as a time for reflection, appreciation and even celebration. This is evident in everything we do, from the way we conduct our services to the amenities we choose to offer. We are not just a funeral home. We are a close knit community dedicated to honoring, sharing and celebrating the amazing and inspirational stories that are life. Our family owned business has a vested interest in serving the community where we live and work. We believe in families and neighbors serving neighbors. The business that is now Trimble Inc. was started on March 13, 1874, as "E. B. Knox, Picture Framing and Undertaking." Our founder, Edwin B. Knox, a pioneer undertaker and early mayor of Moline, began his business on Third Avenue (now Moline's River Drive) at about 18th Street, near the current site of the old post office building. He soon moved across the railroad tracks into a new building located on the site of the parking lot on the west side of 15th Street between Fourth and Fifth Avenues. He was reported to be the first businessman to move away from the "downtown business center" which was then located on Third Avenue. In 1908, after Edwin Knox's son, Luther, had joined his father in business, they closed the picture framing and art supply portion of their business, relocated to a new building they built on Fifth Avenue and 18th Street across from today's Daily Dispatch building, and renamed the business E. B. Knox and Son. A final move to the funeral home's long-time location on Sixth Avenue and 21st Street occurred in 1923, with the purchase of the former Barber residence and its conversion into a funeral home, which they renamed Knox Funeral Home. That building was one of the earliest examples of the then-new 'funeral home' concept in the midwest -- a dedicated home for funerals, rather than a store-front building. E. B. Knox died in 1926, and Luther continued to operate the funeral home until selling to Dorothy and Riley Trimble on July 1, 1945. The firm operated as Knox-Trimble Funeral Home until 1960, when it was renamed Trimble Funeral Home. Eric Trimble joined his parents in business in 1969, and became president of the firm upon his father's death in 1983. The firm has continued to expand, with the construction of the Coal Valley funeral home in 1977, and the acquisition of the Aledo funeral home in 1981. The Aledo funeral home was sold to long-time manager Annette Speer in 2003. For the first time since 1906, the firm diversified into retail in 1985 when it acquired Julius Staack and Sons Florist, Moline's oldest floral shop, founded in 1877. In 1990, the shop, now Staack Florist and Event Planners, relocated to a new building near the Moline funeral home. The flower shop was sold to long-time manager Louise Lorimer in 2010. In 1985, Wilson House Stationers was started in Moline's oldest house. The Trimble Family completed restoration of three 1870's buildings in the Historic Block on John Deere Commons in the Fall of 1999, and opened WaterMark Corners, a diversified retail store offering gifts, jewelry, antiques, children's books and toys, gourmet foods, bath products, and much more. Wilson House Stationers was relocated to WaterMark Corners in 2004, and is now known as WaterMark Stationers. The State of Illinois acquired the firm's main location in downtown Moline for a new I-74 Mississippi River bridge, forcing the family to relocate in 2014. Committed to staying in the center of the Quad City area, the Trimble Family purchased the former Irving School property at 701 12th Street, and built Trimble Pointe, a multi-facited development which includes the Trimble Funeral Home and Crematory, Veterans Funeral Care, Trimble Funeral Planning, and CityView Celebrations, an upscale reception center for funeral luncheons and community events. Barbara and Eric Trimble are the proud parents of Amy, Corporate Secretary and manager of WaterMark Corners, and Reid, Corporate Treasurer and funeral home manager. Reid and his wife, Jennifer, who teaches at Rock Island High School, have three children, Tucker, Claire, and Graham. What is your background with Trimble Funeral Home and Crematory? I graduated from Cornell College in 1968 and from the University of Minnesota Department of Mortuary Science in 1969. I joined my father, Riley Trimble, in the the funeral business on September 1, 1969. How and why did you enter the funeral services business? I had lived in a house next door to our Moline funeral home my entire life until I went to college. As a youngster in grade school, I began helping to mow the grass and wash the cars at the funeral home. It wasn't until my junior year at Cornell College that I decided to become a funeral director. What are your passions within the business? I truly find meaning in helping people at a time when no one else can help them. My father taught me that being a funeral director is a sacred calling because we are entrusted with the most valuable treasure a family has - a loved one. Therefore, we act as if every funeral were for a member of our own family. What have been the most memorable events in your time with Trimble? We have been privileged to serve families from all walks of life, and each is memorable. The expansion of the firm from one funeral home to two funeral homes, a crematory, a reception center, and a gift and stationery store are achievements of which I am particularly proud. What keeps you committed to this business? I cannot imagine doing anything else besides funeral service. The long hours and difficult work are rewarded by families who are truly grateful for our help and comfort. A real joy to me is having my wife, Barbara, and both our children working with me. Barbara and our daughter Amy manage WaterMark Corners, our gift and stationery store on John Deere Commons in Moline. Our son, Reid, now works by my side, as I once did with my father. 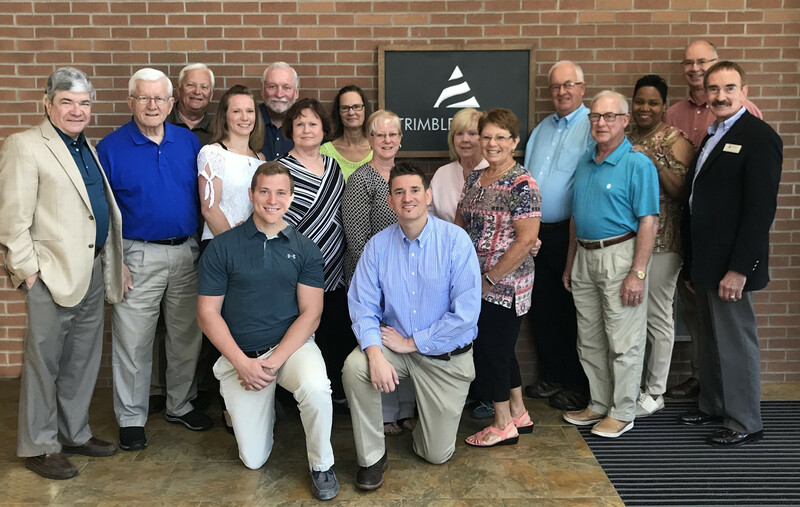 What is your connection with Trimble Funeral and Cremation Centers? I graduated from the University of Minnesota in 2004 with degrees in Mortuary Science from the Medical School and Entrepreneurial Management from the Carlson School of Management. I joined my father, Eric Trimble, on May 1, 2004. I began mowing lawns and parking cars at the funeral home when I was 16. As a young man, I was encouraged to enter a career that would make me happy. Working at the funeral home the summer after my junior year of college helped me realize that serving people is what true happiness is for me. I really enjoy the feeling that I am a part of something that makes a difference in people's lives. My true passion, and the reason that I entered funeral service, is simply to be there for our families. I find myself going through many emotions along the funeral path. Our families experience so many feelings, and I find that the bond I develop with each individual is a miracle beyond words. All of the experiences and amazing people I have encountered since entering the funeral service business have been vastly rewarding for me. I am learning that every family we serve will be etched into my memory for years and years to come. While we are a huge part of their lives for a few painful days, they also become imbedded in our hearts through their stories and personal experiences. I feel honored to be surrounded by people who care deeply about the business, and more importantly, the families that we serve.